Not everything is wrong with Pepperell’s commercial zoning. When the predecessor of Pepperell’s current zoning map was drawn up in 1974, the commercial district was confined to the existing business areas, namely Railroad Square (the railroad still ran through it in those days) and Babbitasset Village, (Main Street between the river and the railroad depot), as well as the east side of the Rotary, which featured a strip mall (Lordens) and an insurance office. After World War II, lots of suburban towns created overly large business districts. These so-called strip zones encompassed long stretches of state highways, in most cases far more commercial land than the town would need in the next fifty years. The result was the ugly commercial strips we’re all so familiar with. Pepperell, in its wisdom, refused to follow this course, and so lower Main Street (and not even all of that) is the only commercial street in town. That’s good. Unlike Dracut, Billerica, and many other places, Pepperell isn’t plagued with miles of tacky commercial strips all over town. Unfortunately, Main Street isn’t a state-maintained highway. We have only one of these in town, Rte. 119. 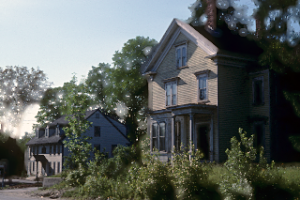 In their admirable zeal to confine Pepperell’s business district to the existing down town and its adjacent residential districts, the town mothers and fathers in 1974 failed to zone even one foot of Rte. 119 as commercial. This left no room at all for larger scale commercial projects, such as shopping centers. Most towns in our regions (Groton and Townsend, for example) located their shopping centers on a state-maintained highway (in this case, Rte. 119), on the edges of town. We could have done this, too (few lived on Rte. 119 forty years ago) but we didn’t. Now it’s probably too late to rezone this road. Another problem: although (contrary to what you sometimes hear) Pepperell has a commercial district large enough to meet the town’s needs, it’s in the wrong place. The entire district is already occupied by buildings, mostly historic nineteenth-century houses on small, shallow lots, that must be demolished to construct parking lots or new buildings, such as banks, pharmacies, or car washes. A lot of nice buildings have already been destroyed here, with more to come. 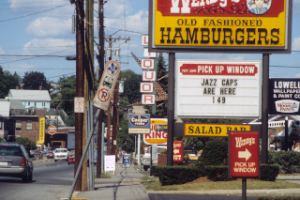 An attempt to establish an historic district in the commercial zone, which could have provided some guidance to this process, was soundly defeated in 1987. When I was a member of the Planning Board back in the 1990s, it was common for citizens to seek appointments to talk to the board. I remember one night when the late Conrad Eaton appeared with a long litany of complaints in hand. After he finished reading us his list of everything we were doing wrong, he looked up at us and said, “You know, I see now that this board has changed since the last time I was here, and I don’t know most of you. So what I’ve said might not apply. Just disregard my comments.” And before we could say anything in reply, he turned around and left! But on one rare occasion, twenty years ago or so, we had a visitor who was truly enlightening. Mr. Austin Mason, who lived on Prescott Street, had served on the Pepperell Industrial Development Commission. He explained to us that before retirement he had served as a location executive for a Fortune 500 corporation, siting facilities all over the country. His intention, he explained to us, was to use his experience to show us how he viewed Pepperell’s commercial and industrial prospects. I can still remember the gist of what he told us. First, the possibility of a major employer locating in Pepperell was slim. Why? It turns out that the single most important factor in locating a plant or office was the distance to the nearest highway interchange. With no limited access expressway running through Pepperell or any adjacent town, we were simply too far away. DEC located a major facility in Littleton, right off Route 495; it never seriously considered Pepperell. Moreover, our proximity to a state without an income tax further discouraged executives from locating offices on this side of the border. Similarly, the absence of a sales tax kept big retailers from building in Massachusetts adjacent to New Hampshire. However we changed our zoning, Mr. Mason concluded, Pepperell will never be able to transfer a significant share of our tax bill from residential to commercial or industrial property. Austin Mason died a number of years ago, but time has proved him right. One of our leading realtors once told me that he had been unsuccessful in trying to help a client buy a franchise to open up a business in Pepperell. The first question the companies always asked him was how far the town was from the nearest Interstate. It was always too far. And to this day, no Fortune 500 or 1000 corporation has located a facility here, aside from a drugstore and a doughnut shop (years ago, long before my time, the town had an A&P supermarket). Nor is one likely to appear. Still, some of our town fathers continue to tell us that the town can build its way out of its present financial straits by expanding our commercial district and enlarging our tax base. Too bad they weren’t able to talk to Mr. Mason.